Our innovative machining and fabrication technology has made Roebuck Precision Machine Inc. the leader in machining and material handling products for over 24 years. 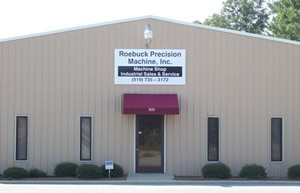 Roebuck Precision Machine is the "Industry Choice" for quality dependable products due to our dedication to excellence and our company's keen vision of focus on your ever changing needs. It is our goal to manufacture, fabricate, reengineer, or provide you hundreds of quality products from one of our many product lines. Our sales staff always provides and responds to the needs of our customers. If you do not find a product in our catalogs that specifically addresses your application please give us a call and we will gladly tailor to your needs. Our support staff with over 50 years of experience will gladly work with you on any and all of your material handling needs and industrial products. Thanks to our dedicated customers we continue to set the standard in the specialty material handling industry. Copyright 2008-2009 Roebuck Precision Machine Inc.